I have been a Brandeis National Committee (BNC) member for quite a few years and lately had been thinking about quitting, for no special reason. Then the Summer issue of Brandeis Magazine arrived. I have never enjoyed a magazine as much. “The Hollow Promise of Sovereignty” (Brief Perspective) grabbed my attention first. Each subsequent article spoke to me, too. I even watched Simon Sinek’s TED Talks. This issue of your magazine really speaks to the “why” of Brandeis and what inspires its alumni. Any university that educates the way Brandeis does deserves my support. I just wanted to let you know how much I enjoyed the Summer issue. The articles were really excellent. Kudos to your staff and you for another well-produced edition. As a BNC Desert chapter member, I really enjoyed the Summer issue. Although I have met former U.S. ambassador Dan Shapiro ’91, I didn’t know about his Brandeis connection. Great to read about all the contributions Brandeis grads are making to improve our society. 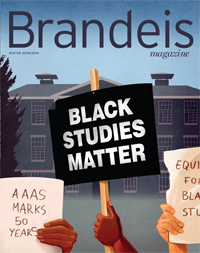 The Summer issue cements for me the conviction that Brandeis and the magazine have become irredeemable leftist organs. I cannot stomach the propaganda any longer. The rhetorical fluff of “The Hollow Promise of Sovereignty” is embarrassing for the magazine of a supposedly intellectual institution. And the participant list for “Fake News: A Roundtable Reaction” (Arts and Culture) is a clear revelation of how in the tank the magazine is for the left: ABC News, The New York Times, CNN, The Washington Post — the list reads like the instructions for an echo chamber. Where in such a group is intellectual debate even possible? The fine address by Stephen Donadio ’63 at President Ron Liebowitz’s Inauguration (Winter 2016/2017) brought back my amazing years at Brandeis. I was a willing refugee — first from the Deep South and then from two years at a complacent Ivy League women’s college. At Brandeis, I was lucky to experience two years of unsettling and formidable intellectual challenge. My teachers — Ray Ginger; Allen Grossman, PhD’60; Irving Howe; Seth Benardete; Frank Manuel — made it clear the life of the mind was also a life of social commitment. My first class was in European intellectual history. Professor Manuel asked whether we thought there was a fundamental difference between presidential candidates John F. Kennedy and Richard Nixon. Many of us did, including me. Manuel certainly smiled and may have even laughed at us. Too naive to understand everything he was getting at, I grew in awareness. The following spring, Irving Howe walked into his course on the English novel, a copy of The Justice in his hand. It included a story that questioned whether Adolf Eichmann should be tried by Israel or by the World Court, which at the time was barely functional. Howe was weeping, furious that, in an attempt to seem liberal, the student editors had solicited and included an opinion from George Lincoln Rockwell, founder of the American Nazi Party. One of my fellow students arranged a debate between Howe and Harvard historian Oscar Handlin on the subject. I remember Howe saying, “There is a time to hate,” which struck me hard and shattered my genial liberalism. I am grateful to Brandeis for who I am. It’s been almost 60 years since I took Irving Howe’s Yiddish literature course as an undergraduate. It was one of my favorite classes. So I enjoyed Lawrence Goodman’s article “A Fool in Yiddishland” (Summer), because attention must be paid to the Yiddish language, which is so much a part of Jewish culture. Many Yiddish words, such as schlep and klutz, have become part of the English vernacular because their sound conveys their meaning so precisely. Like Yiddish literature, the Yiddish language makes us laugh and cry at our foibles. I also can’t agree with John Klier, whom Mr. Goodman cites as stating that Jews emigrated to America to seek economic opportunity, not to flee oppression. Both my parents escaped to America, my mother with her whole family from Minsk, my father alone at age 15 from Wolkowysk, a farming area. I believe my father did leave for America because of its economic promise. But my mother left to flee pogroms. She and her sister would hide in an unlit oven whenever they heard the Cossack army thundering by on their horses. I have lived in Kansas, a so-called flyover state, for 33 years since graduating from Brandeis. The Topeka Civic Theatre produced “Fiddler” most recently in July 2010. The director and cast worked with the rabbi from the local temple. The man who played Tevye was magnificent. The production was as good as the two professional “Fiddler” productions I have seen. The audiences loved it. This attitude toward “flyover states” is why the Democratic Party lost many votes in the 2016 presidential election. Stop writing us off. Kansas is already swinging back against the Tea Party Republicans, ahead of other states. I do hope Mr. Goodman keeps learning Yiddish.